An active member and current Trustee of the American College of Cardiology, Dr. Handberg serves on several committees including the ACC Scientific Sessions planning committee, PC3, Compensation, Metabolic Work Group, and is a member of the CV Team Council leadership group. 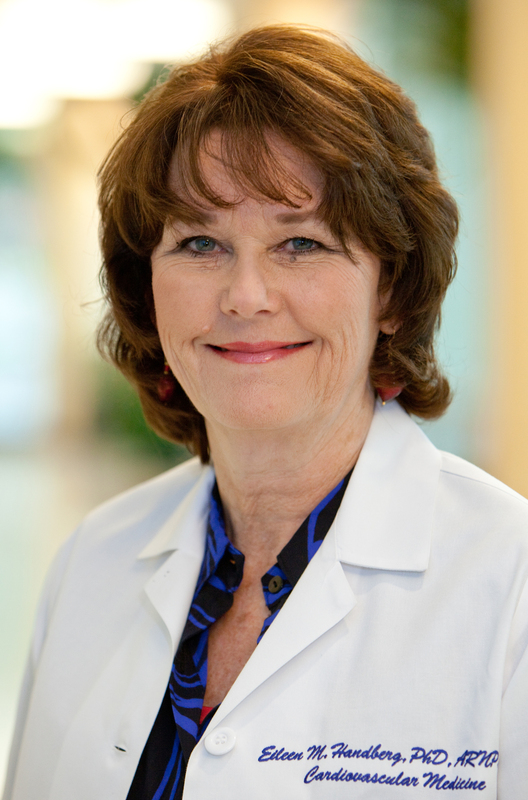 She is the co-director of the ACC Core Curriculum for the Cardiovascular Clinician program, and served as co-chair of the Team-Based Work Group. She has served on several Presidential appointed committees including the search committee for the JACC Editor, and CEO search committee. She was the past Chair of the Nurse Education Committee, and has served on the Accreditation, BPQI committees and Anticoagulation Task Force. In 2009 she qualified for the designation FACC and was the first nurse (CCA) to achieve this recognition. Additionally she is a member of the American Heart Association’s Council on Cardiovascular Nursing and the Preventive Cardiovascular Nurses Association (PCNA), and is program director for the Vascular Biology Working Group (VBWG). She has contributed to over 130 articles, featured in the Journal of the American College of Cardiology, Journal of the American Medical Association, Circulation, and the Journal of Women’s Health, among others. Baptista LC, Jaeger BC, Anton SD, Bavry AA, Handberg EM, Gardner AK, Harper SA, Roberts LM, Sandesara B, Carter CS, Buford TW. Multimodal Intervention to Improve Functional Status in Hypertensive Older Adults: A Pilot Randomized Controlled Trial. J Clin Med. 2019;8(2):E196. Hwang CL, Lim J, Yoo JK, Kim HK, Hwang MH, Handberg EM, Petersen JW, Holmer BJ, Leey Casella JA, Cusi K, Christou DD. Effect of all-extremity high-intensity interval training vs. moderate-intensity continuous training on aerobic fitness in middle-aged and older adults with type 2 diabetes: A randomized controlled trial. Exp Gerontol. 2019;116:46-53. Rambarat CA, Elgendy IY, Handberg EM, Bairey Merz CN, Wei J, Minissian MB, Nelson MD, Thomson LEJ, Berman DS, Shaw LJ, Cook-Wiens G, Pepine CJ. Late sodium channel blockade improves angina and myocardial perfusion in patients with severe coronary microvascular dysfunction: Women’s Ischemia Syndrome Evaluation-Coronary Vascular Dysfunction ancillary study. Int J Cardiol. 2019;276:8-13. Bairey Merz CN, Olson MB, Kelsey SF, Bittner V, Reis SE, Reichek N, Handberg E. Weight cycling and cardiovascular outcome in women with suspected ischemia: A report from the NHLBI-sponsored WISE Study. PLoS One. 2018;13(12):e0207223. Herscovici R, Sedlak T, Wei J, Pepine CJ, Handberg E, Bairey Merz CN. Ischemia and No Obstructive Coronary Artery Disease ( INOCA ): What Is the Risk? J Am Heart Assoc. 2018;7(17):e008868. Elgendy IY, Mansoor H, Li Q, Guo Y, Handberg EM, Bairey Merz CN, Pepine CJ. Long-term mortality and estimated functional capacity among women with symptoms of ischemic heart disease: From the NHLBI-sponsored Women’s Ischemia Syndrome Evaluation. 2018;206:123-6. Miller AP, Handberg EM, Rodgers GP. It Takes a Team to Deliver Optimal Cardiovascular Care. J Am Coll Cardiol. 2018;72(8):948-51. Walejko JM, Kim S, Goel R, Handberg EM, Richards EM, Pepine CJ, Raizada MK. Gut microbiota and serum metabolite differences in African Americans and White Americans with high blood pressure. Int J Cardiol. 2018;271:336-9. Elboudwarej O, Wei J, Darouian N, Cook-Wiens G, Li Q, Thomson LEJ, Petersen JW, Anderson RD, Mehta P, Shufelt C, Berman D, Azarbal B, Samuels B, Handberg E, Sopko G, Pepine CJ, Bairey Merz CN. Maladaptive left ventricular remodeling in women: An analysis from the Women’s Ischemia Syndrome Evaluation-Coronary Vascular Dysfunction study. In J Cardiol. 2018;268:230-5. Sayre SL, Bettencourt J, Cohen M, Vojvodic RW, Perin EC, Yang PC, Murphy MP, Taylor DA, Handberg E, G’Sell P, Moyé L, for the Cardiovascular Cell Therapy Research Network (CCTRN). Expectations of cell therapy: An evaluation of the Cardiovascular Cell Therapy Research Network (CCTRN) Patients with Intermittent Claudication Injected with ALDH Bright Cells (PACE) Trial. Clinical Researcher. May 2018;32(5). Kim S, Goel R, Kumar A, Qi Y, Lobaton G, Hosaka K, Mohammed M, Handberg EM, Richards EM, Pepine CJ, Raizada MK. Imbalance of gut microbiome and intestinal epitheilial barrier dysfunction in patients with high blood pressure. Clin Sci (Lond). 2018;132(6):701-18. Gong Y, Smith SM, Handberg EM, Pepine CJ, Cooper-DeHoff RM. Intensive blood pressure lowering reduces adverse cardiovascular outcomes among patients with high-normal glucose: an analysis from the Systolic Blood Pressure Intervention Trial database. J Clin Hypertens (Greenwich). 2018;20(4):620-4. Wei J, Bakir M, Darouian N, Li Q, Landes S, Mehta PK, Shufelt CL, Handberg EM, Kelsey SF, Sopko G, Pepine CJ, Petersen JW, Berman DS, Thomson LEJ, Bairey-Merz CN. Myocardial scar is prevalent and associated with subclinical myocardial dysfunction in women with suspected ischemia but no obstructive coronary artery disease: from the Women’s Ischemia Syndrome Evaluation–Coronary Vascular Dysfunction study. Circulation. 2018;137:874-6. Please click here for a list of Dr. Handberg’s industry relationships.